It's a brief recycle bin this week focusing solely on Rioja. Why? As we enter the autumnal season, our dinner menus will change, incorporating richer, fuller-flavored foods. And as our ingredients evolve with the weather, so to will our wine selections. Another reason to focus on Riojas is because it's one of the few wines still aged before release without being punitively priced. Note that the Gran Reserva below is almost seven years old and still priced around $20. Generally speaking, Rioja comes in four levels: plain old (actually young) Rioja, Ciranza, Reserva, and Gran Reserva. Rioja is young, energetic, and typically simple, and spends less than a year in barrel. Crianza is aged for two years, at least one of which is in oak. Reserva is aged for three years, at least one of which is in oak. And Gran Reserva is aged for at least five years: two in oak, three in bottle. 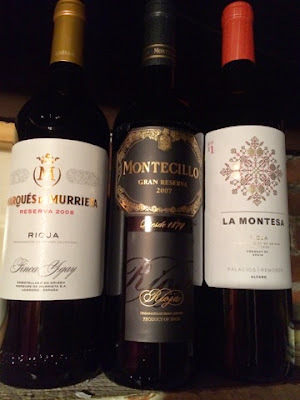 All of these wines are dominated by, if not made exclusively from, the Tempranillo grape, though other indigenous varieties are blended in, particularly in the younger bottlings. A wine that's going through an impetuous adolescent phase. Indifferent on opening, promising after an introductory gulp of air, and finally full of oak-override hubris. Needs a bit to settle down, but I'm looking forward to revisiting soon. Having mellowed considerably since first tasting this vintage in Barcelona a couple of years ago, and like its Rioja brethren, the Murrietta is still jumpy thanks to an abundance of American oak. Despite that minor distraction, this wine still has the trademark soul of sun-kissed earth and hard-working hands that is the hallmark of Rioja. This is old school aged Rioja, replete with a thinning body, yet still-youthful tannins. American oak shows prominently, but a fatty lamb dish would put this graceful wine into very favorable light. Fun to revisit Gran Reserva. Montecillo has been a stalwart staple of the Rioja experience for decades - and for good reason. Their wines - from Crianza to Reserva to Gran Reserva never fail to transport the imbiber. "(B)rief" and to the point I like! Well done!